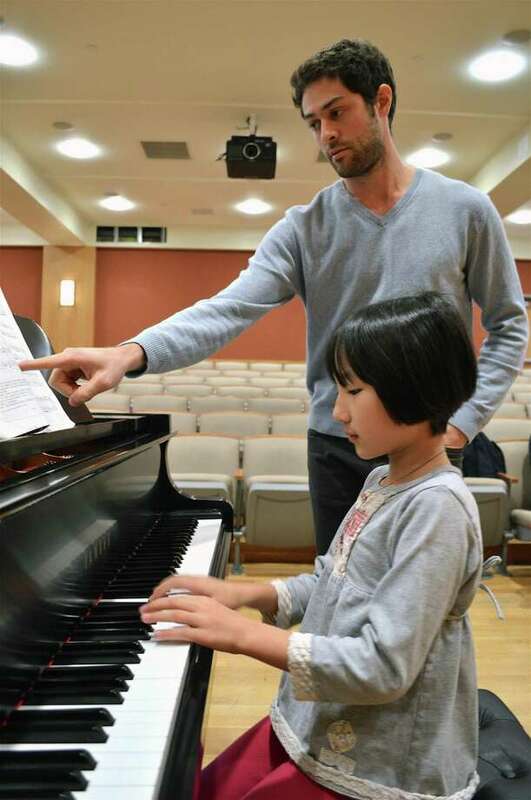 Zachary Saffa instructs Kayla Huang, 9, of Greenwich, at the Studio Showcase Series at Darien Library, Sunday evening, Nov. 11, 2018, in Darien, Conn.
DARIEN — Back home to share his talent with the community — and also to highlight the importance of teaching the arts — Zachary Saffa went to the Darien Library on Sunday evening for the third time in its ongoing Studio Showcase Series. A unique combination of concert and education demo, Saffa, who graduated Darien High School in 2006 and currently calls New York City home, invited several young people to perform classical pieces on piano in front of an audience. He then offered caring critique and guidance of their work with people able to observe his input directly and how the students processed it. The event finished with him performing, as well as a reception afterward. Saffa also said there were too few venues available for young people to have a “low-stakes environment” in which to play classical music in front of people without it being competitive. Young people who are interested in being considered for the next showcase are encouraged to contact the library.